MOHAMMAD AMIN'S name is well-known, even five kilometres away from his village of Gulzarpora in Kashmir’s Pulwama district. One just has to ask the address “of the sarpanch (head of the village) who was killed last year”. And out comes the story. On the night of April 15, 2014, four people in army uniform came at around 10 and asked Amin to guide them to militants supposedly hiding in the village. After 15 minutes, people heard gun shots. And residents of the village knew the sarpanch had been killed. Amin is one among 14 sarpanches who have been shot dead by militants ever since they were elected in a landmark election in 2011. But now, with only one year remaining for the next panchayat elections (due in June 2016), the sarpanches have called for a boycott. 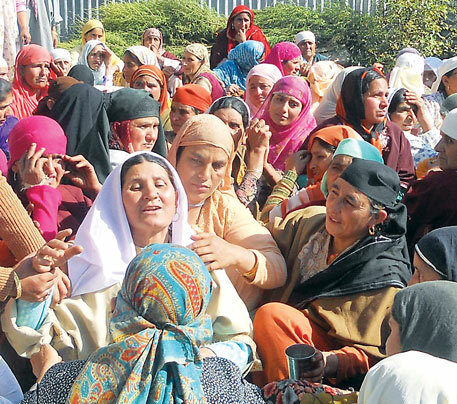 While talking to Down To Earth, chairperson of the All Jammu and Kashmir Panchayat Conference (AJKPC), Shafiq Mir, said that the AJKPC has decided not to participate in the next panchayat election. The reason is their “irrelevant” role in the development of the state. Imtiyaz Afzal Beigh, head of AJKPC’S Kashmir chapter, hails from Duroo, the native village of separatist leader Syed Ali Shah Gilani. He remembers his experience during the 2011 election. Initially, there was concern as to whether militants would allow the election to be held. Other concerns were whether candidates would come forward to fight the election and whether voters would come forward to vote. However, turnout was an overwhelming 80 per cent. Beigh and Mir too participated, hoping that the situation on the ground would improve. But it did not happen. “We felt we were being mocked. We were not able to do any work on the ground, so a sense of irrelevance overpowered us. Then, the killing of the sarpanches began. It resulted in mass resignations-at least 70 per cent sarpanches and panches announced their resignations through the media. “However, the resignations were not accepted by the government,” says Mir. Why Mir and others feel helpless is because they cannot get any development work done in their villages. This is because the state government has not devolved powers for self-governance. Most importantly, the state has failed to put the three-tier Panchayati Raj system in place. The Jammu and Kashmir Panchayati Raj Act of 1989 does not decentralise power as is the case in the rest of India. One of the most serious flaws in the Act is related to government intervention in the composition of panchayats, say experts. The 73rd Amendment of the Indian Constitution has created decentralisation of power, according to which there would be gram panchayats (at the village level), block parishads (at the block level) and zilaparishads (at the district level). But, this is not the case in Jammu and Kashmir. Though elections were held to the gram panchayats, there is no block parishad and zilaparishads in place. In their absence, sarpanches don’t know where to submit plans, and thus, no schemes were executed. Abdur Rashid Dar, a panch of Gopalan Ghat in Baramulla district, says he does not have any job to perform. He does not even have any say in money coming for the Mahatma Gandhi National Rural Employment Gurantee Act (MGNREGA). There is no development work in the village, he says. Interestingly, the panchayats have ininitiated development works amounting to Rs 400 crore, for which payments have not yet been made. Mir says that newly elected chief minister of the state Mufti Mohammad Sayeed has issued statements in support of the sarpanches a couple of times. “But, it won’t work. We need a complete change in the system,” he adds. And what was the previous National Conference-led government doing all this while? To its credit, the government did promise to decentralise power several times. It brought the 73rd Amendment for discussion in the Cabinet, but not in the Assembly. Ali Mohammad Sagar, panchayat minister in the erstwhile National Conference government, says his government did an admirable job of holding panchayat elections after 37 years which were successful at every level. He said that power has been decentralised by several orders and notifications, but people did not understand it. However, when asked about elections at the block and district levels, he admitted that his government had failed. 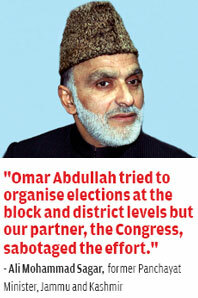 “Omar Abdullah tried to hold elections for these bodiesbut our partner, the Congress, sabotaged the effort,” he said. 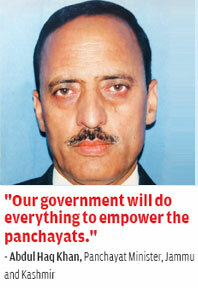 Current Panchayat Minister Abdul Haq Khan says his government has been in power hardly for two-three months and will do everything to empower the panchayats. “However, there is no need to bring the 73rd Amendment to this state. The existing law is sufficient for this purpose,” he adds. Despite the gloomy scenario, experts believe that a solution to the problem is in the offing and candidates will come forward to fight the next election. Based on the 14th Finance Commission’s recommendation, the Centre has decided to flush states with huge funds for empowering panchayat institutions. The Commission had suggested increasing states’ share in the net proceeds of Union taxes to 42 per cent from the current 32 per cent, and make the funds available to local bodies, both rural and urban. Jammu and Kashmir will get up to Rs 60,000 crore in the five-year period ending March 2020 as per recommendations of the Commission. Out of this, Rs 4,769 crore would be given for local self-government. Shahnawaz Alam, professor at Kashmir University, says, “The state cannot compromise the huge money it is supposed to get from the Centre.” To avail this, the state has to empower the panchayats, he adds. Certainly, the Centre intends to put pressure on the state government to strengthen its panchayat system. “We will now have to closely monitor the use of funds, especially in states where the panchayati system is weak. We need to interact with states to create panchayat level planning and would also push for dedicated panchayat cadre. That will be our vision,” Vijayanand, secretary in the panchayati raj ministry, said while talking to Down To Earth.